On a busy weekend, the overall British Athletics League and UK Women’s Athletics League champions were decided, while earlier in the week Mohamed Ali smashed the world age-14 3000m best in Wimbledon. Catch up on some of the latest action below and see the August 9 edition of AW magazine for much more. Birchfield Harriers duly secured their fourth successive Premiership victory but were headed on the day by a resurgent Newham & Essex Beagles. The league champions had six A string wins to just three for Newham, but lost out on minor placings to concede the match by 35 points. Birchfield’s best performer was Sadam Koumi (pictured) as he clocked 46.56 to win the 400m. Jake Porter won the 110m hurdles in 13.89, while Jack Phipps and Ryan Webb added pole vault and high jump wins. BUCS champion Jack Roach claimed the long jump for Newham before the match winners added the sprint relay to close off a good team effort. Thames Valley Harriers narrowly won the Premier Division from Birchfield Harriers, though Birchfield won on the day. Jessica Tappin and Angela Barrett were among the TVH winners, clocking 59.97 in the 400m hurdles and jumping 6.03m in the long jump respectively. Alicia Barrett claimed 100m hurdles victory in 13.30, while Edinburgh AC’s Alisha Rees won the 200m in 23.62 and was second in the 100m behind Hannah Brier – 11.53 to 11.64. Tamara Armoush claimed a 1500m and 3000m double for Birchfield, while Laura Samuel won the triple jump with 13.12m and Eden Francis completed a shot put and discus double. The conditions were perfect for good times and there were 85 PBs in the seven 3000m races. 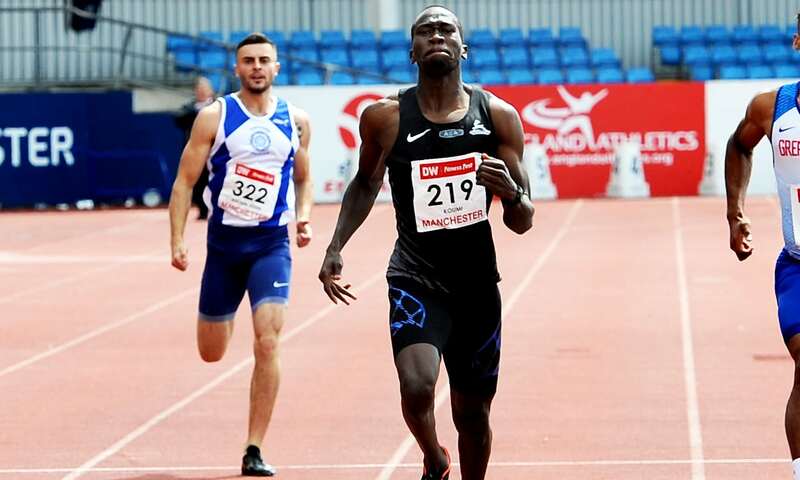 Among them was the hugely impressive 8:15.02 by Mohamed Ali for fifth place in the final race – that time breaking the world age-14 best which had been set by Chikashi Ikeda with 8:21.22 in 2012 in Japan. Roger Poolman won the race in 8:11.63, while the fastest woman of the day was Emily Hosker Thornhill in race four with a time of 9:03.06, beating her previous best of 9:11.16. Ali went on to clock the weekend’s quickest UK parkrun time, with an under-15 best of 15:14 at the Northala Fields event in London. Lauren Williams, Chad Miller and Jason Nicholson were among the winners as the GB team placed second overall in their under-20 international match with Germany and France at the Olympic Stadium in Berlin. Williams took more than a second off her PB as she clocked 58.09 to dominate the 400m hurdles, while Miller won the 100m in 10.45 and Nicholson secured 110m hurdles success. Para-athletes Sophie Hahn, Olivia Breen and Luke Nuttall continued their preparations for the World Para Athletics European Championships in Berlin by competing in Loughborough. Fresh from her 200m world record performance at the Müller Anniversary Games, Hahn raced over 100m for the first time since she claimed a Commonwealth Games title and ran a time of 12.72, her ninth quickest run of her career. Long jump world champion Breen raced over 100m for the third time this year, with a time of 13.66. Nuttall, preparing for his first senior major championships, ran the 800m in a lifetime best of 2:03.43. Meanwhile, European U18 Champs representative Lewis Byng had a busy afternoon, producing a throw of 16.69m in the shot put and a lifetime best in the discus throw of 42.41m. New Zealand’s Jake Robertson came close to his PB with 27:37 for a clear win ahead of Kenya’s Stephen Sambu in 28:27. Ben True was third, two seconds back. Britain’s Callum Hawkins and Ross Millington both claimed top 10 spots, with Hawkins running 29:16 in seventh and Millington clocking 29:32 in ninth. Kenya’s Sandrafelis Chebet Tuei won the women’s race in 31:21 ahead of Ethiopia’s Ababel Yeshaneh with 31:26. USA’s Molly Huddle clocked 31:31 in third. Dewi Griffiths and Elsey Davis won a hot inaugural edition of this event, clocking 29:48 and 34:37 respectively. Griffiths, continuing his return after injury, defeated Matt Clowes by around 200 metres. John Millar from Ipswich Harriers, a former English Schools champion, dominated from the start and comfortably won the race in 30:40 to go top of the road 10km under-20 rankings. The women’s field was headed by Helen Davies from the host club Ipswich JAFFA as she finished fifth overall in a lifetime best of 34:15, which took her to third in the V35 rankings. Nick Jones ran out the winner of both the open race and the British veterans’ championship, enjoying a near 100m advantage over fellow M40 Dave Bennett as he won in 34:10. Kelly Edwards and Elizabeth Renondeau were closely matched in the women’s race, to annex the W40 and W35 titles respectively in 39:54 and 39:57. This event doubled as the trial for the World Mountain Running Championships (Uphill). Jacob Adkin won the senior men’s title from Andrew Douglas and Andrew Davies, while European (up and down) bronze medallist Emma Gould led from the start and won the women’s title by nearly three minutes from Victoria Wilkinson. Anna McFadyen and Joe Dugdale claimed junior victories. Kenya claimed a total of 11 gold medals, with 16-year-old Edward Zakayo among the winners on the final day of competition as he won the 5000m in 13:48.58 from Ethiopia’s Getaneh Molla and Yemane Haileselassie of Eritrea. World record-holder Beatrice Chepkoech led a Kenyan clean sweep in the women’s 3000m steeplechase, clocking 8:59.88 ahead of Celliphine Chespol with 9:09.61 and Fancy Cherono. Stacy Ndiwa won the women’s 10,000m from Alice Aprot – 31:31.17 to 31:36.12. World champion Hellen Obiri claimed a dominant win in the 5000m, running 15:47.18 to win by more than 10 seconds. South Africa claimed a total of 30 medals and contributing to that tally was world champion Caster Semenya as she retained her 800m title in a championship record of 1:56.06 and also won the 400m in a national record of 49.96. A brilliant men’s long jump battle was won by South Africa’s Ruswahl Samaai from his team-mate Luvo Manyonga as Samaai retained his title with a leap of 8.45m to Manyonga’s 8.43m. Akani Simbine won the 100m in 10.25. Marie-Josée Ta Lou of Ivory Coast won the 100m in 11.15 and the 200m in 22.50. Nijel Amos retained his 800m title for Botswana in 1:45.20, beating Kenya’s Emmanuel Korir with 1:45.65. Ese Brume claimed victory in front of home fans as she successfully defended her long jump title with a best of 6.83m, while Tobi Amusan won the 100m hurdles in 12.86.